The Gate of Heavenly Purity (Qianqing men) is the principal entrance to the Inner Court (nei ting) of the Forbidden City. Since its completion in early fifteenth century, it has been rebuilt many times because of damage or total destruction by fire. The current gate is datable to the third year of the Jiangqing reign (1798). In Qing times, emperors held Morning Audience at this gate. Among them, the Kangxi Emperor (r. 1662-1722) was the most diligent. On the day of morning audience, at around eight o'clock in the morning, he ascended the throne placed in the center of the marble platform of the gate, receiving ministers' reports on state affairs and responding with corresponding instructions. Flanking the south face of the Gate of Heavenly Purity are glazed tile screens. At the foot of the stairs in front of the gate are placed a pair of gilt bronze lions and a pair of gilt bronze water vats. 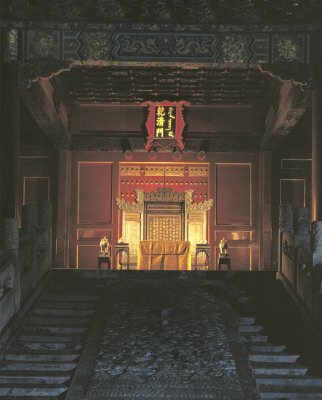 The platform of the gate joins the raised imperial passage to the north that leads all the way to the foot of the marble stairs in front of the Palace of Heavenly Purity (Qianqing gong).